Based on the GL1800 Gold Wing platform, Honda’s new stripped-down Gold Wing F6C injects a jolt of adrenaline into the power cruiser arena, with that incredible horizontally opposed six-cylinder engine and rock-solid chassis married to commanding style and show stopping presence. A great deal of style and bigger deal of engine — two essential components that make a boulevard-shredding power cruiser special. Not only should it be a motorcycle to be seen on, it must have power to revel in. With a design that stops a street of traffic in full flow. The original — and naked — 1975 GL1000 Gold Wing set the benchmark for the breed, with its horizontally opposed four-cylinder engine and cruising form. And it quickly became the definitive touring motorcycle thanks to a turbine-smooth power delivery and mile-munching ability. A six-cylinder 1500cc overhaul in 1987 kept the fully dressed Gold Wing on top and in 1996 a stripped-down version, the F6C Valkyrie, took the Wing back to where it all began. The GL1800 replaced the GL1500 in 2000 and for 2014 the brand new Gold Wing F6C is ready, built very much with a 21st century attitude, design and performance. The F6C forms a bridge between the new CTX1300 and the Gold Wing F6B/GL1800 Gold Wing. 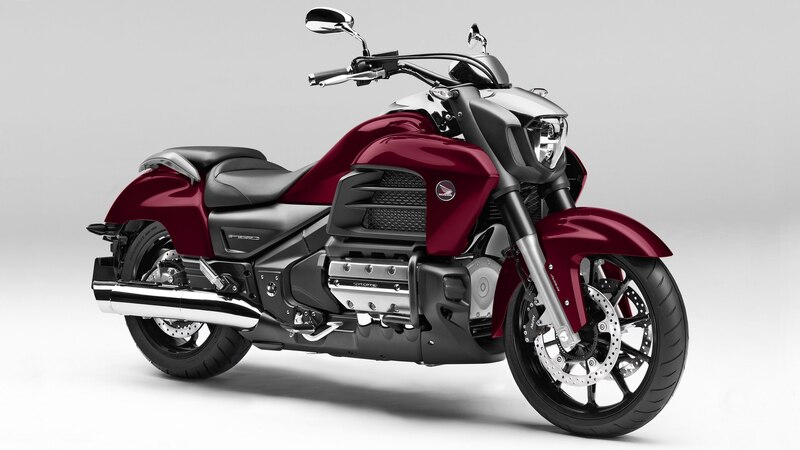 It’s lighter than its fully loaded touring-focused Gold Wing siblings and provides a riding experience that’s dynamic when required and chilled-out when not. — thanks to well-controlled suspension, dual four-piston caliper front brakes and ergonomic riding position. And its visual appeal — low, mean and muscular — makes a dramatic statement, the bodywork underpinned by the massive aluminium beam frame’s powerful line and the engine’s twin cylinder banks. The F6C is an impossible machine to ignore. The F6C employs the bare minimum of chassis needed to bolt a rider to its mighty motor. Constructed from lightweight multi-box aluminium sections the twin-spar frame is aided by the engine’s low centre of gravity (it also acts as a stressed member) to create superbly balanced handling at all speeds. A new aluminium subframe lowers the F6C’s tail. Easy ground reach — seat height is just 734mm — and a comfortable, carefully shaped seat that’s just 300mm wide at the critical portion aids rider confidence at standstill. The 45mm telescopic forks are matched to a Honda Multi-Action System (HMAS) monoshock that can be adjusted manually for spring preload; it works through Pro-Link on the single-sided aluminium swingarm. Spring and damping rates front and rear have been modified to suit the F6C’s weight reduction and urban cruiser intent. Compared to its siblings, the F6C’s steering geometry is stretched out: rake is set at 29° 50′ with 114mm trail. Overall dimensions are 2,473mm (L) x 942mm (W) x 1,154mm (H) with wheelbase of 1,707mm. Kerb weight is 341kg. For improved stability in naked form the front/rear weight bias has been adjusted to an effectively even 49.9/50.1, and the engine support beam’s rigidity balance subtly adjusted (made ‘softer’) for improved rider feel through the chassis. Wide, rubber-mounted swept-back handlebars provide leverage and control. To deliver the required grip levels with neutral handling characteristics an F6C-specific 19-inch cast aluminium front wheel wears a low profile 130/60-R19 tyre, the 17-inch rear a wide 180/55-R17. The brake system features twin 310mm floating front discs and opposed four-piston calipers, plus a rear 316mm ventilated disc/three piston caliper with 2-channel ABS for safe stopping in slippery conditions. The F6C’s bold look is chiseled and purposeful. Flowing organically from the solid front quarter it builds on the frame and engine’s strong, burly form and the twin rear mufflers define and underscore the rear quarter. The F6C has a clean and un-cluttered custom look and boasts full LED lighting — headlight, taillight, running lights and indicators — providing great visibility plus unique light signatures. All instrumentation is housed in a stylish dash with ‘negative’ LCD display. The goal for the F6C’s engine was to produce a rush of acceleration at a split-second’s notice from a standing start. It also needed to provide epic, unforgettable drive from low rpm in top gear and offer up super-smooth throttle response everywhere in the rev-range. Honda’s 1,832cc horizontally opposed SOHC 12-valve six-cylinder unit has a real head start in the power delivery department. Fed by PGM-FI controlled fuel-injection with twin 40mm Keihin throttle bodies, it employs an F6C-specific 6.6-litre airbox and panel-type air filter. Bore and stroke is set at 74mm x 71mm, with compression ratio of 9.8:1. It produces 167 Nm torque at just 4,000 rpm, with peak power output of 85kW @ 5,500 rpm. Location of the radiators proved an interesting challenge, as they could not be front mounted. Side mounting was the natural solution with airflow managed by optimised channeling within the side cowls. The five-speed gearbox (which employs 5th as very much an overdrive for relaxed cruising) delivers the engine’s torque via shaft drive. The hydraulic clutch lever’s pull ratio has been revised to offer a lighter action — less than 60N load — for stress-free operation. Over 10 exhaust systems were prototyped during development, with countless internal structures and end-caps. The engineers were searching for a perfectly balanced exhaust note with dual personality — a throaty growl at low-rpm and high-pitched crescendo at maximum rpm. In the end they were very satisfied with their efforts, and the result. The left hand muffler has a slightly larger 3.8-litre volume, the right 3.3-litre. The F6C engine is Euro III compliant. For improved environmental performance in addition to the air injection system reducing the oxidation reaction of unburned gases, the Honda Evolution Catalysing System 3 (HECS3) employs a three-way catalytic process and ensures greatly reduced nitrogen oxide, hydrocarbon and carbon monoxide output levels. Brake Type Front: 310 x 4.5mm dual hydraulic disc with 4-piston calipers, ABS,floating rotors and sintered metal pads. Brake Type Rear: 316 x 11mm ventilated disc with 3-piston caliper, ABS and sintered metal pads.